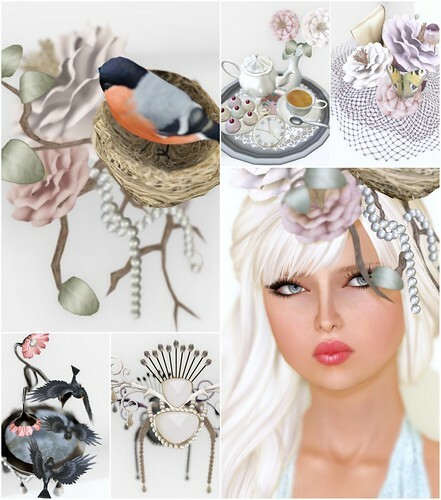 These gorgeous new hats and headpieces are from Donna Flora, and available at Accessory Fair 2011. I’m a big fan of Donna Flora, no surprise there, cos the jewelry pieces are stunning and probably one of the best vintage brands in SL. Visit AF2011 at The Dig or The Oasis sim and discover hidden treasures! AF2011 ends June 26th. Sugar, try the body co. skins! Lavander is soooo cute! It’s funny that you’re talking about Donna Flora today cuz I just got the Reine gown you talked about back in January. Took me a while before purchasing it but I’m glad I finally did, it’s beyond gorgeous! !